According to the 2006 Census, 5.5% of the population of Canadian children and youth between 0 and 24 years identified as Aboriginal. The proportion varied greatly by province and territory. 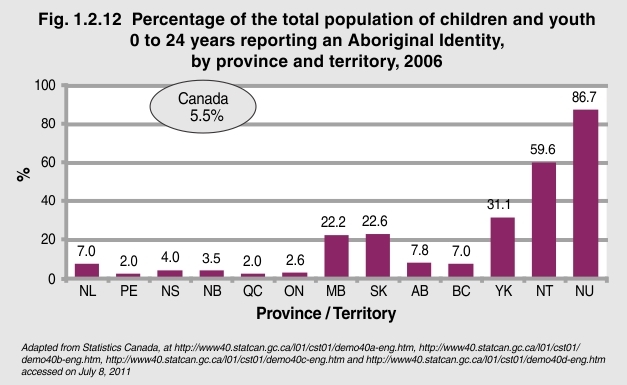 While the number of children and youth with Aboriginal identity may be highest in Ontario – the proportion of Aboriginal children and youth is much higher west of Ontario and in the Territories. In the Northwest Territories and Nunavut, over half of all children and youth reported Aboriginal identity. That proportion was almost a third in the Yukon. Over 20% of all children and youth in Manitoba and Saskatchewan reported Aboriginal identity compared with around 2% in Ontario and Québec. Resources and services that are culturally unique must be available wherever Aboriginal children and youth live.